Time flies and we often don’t hear any news about our German Shepherd owners who left and now live far away. One of our members was Daphne McDowall. 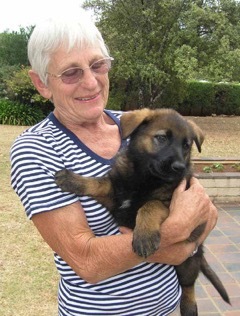 I can’t remember all her dogs, but do know about her keen trading and entering her dog Jutta. 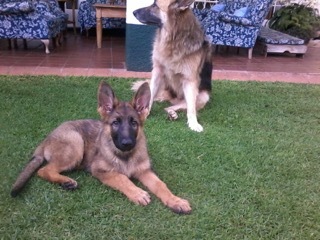 She got Jutta in 1987 who was a pup from Tanah Merah Diana and Gero com Trei Madelhaus [Imported form Belgium]. Daphne entered Jutta many times and was so dedicated. In 2006 she got Wuckey, named her Nicky? who was form Bakhari of Barchaelo [imported from S Africa] and Tanah Merah Rambutan. Fairly soon Daphne immigrated to Australia to live with her son on the East coast, Nicky then came to live with Daphne’s daughter Susan. A few weeks back Daphne got bad flu which turned into bad pneumonia. Because of this she had a vey bad cough which caused to get her a strangulated hernia, poor girl. Had to have the hernia operated on and had a heart attack. She was in ICU for over a week. Susan managed to get a flight to Australia to be with her and thank goodness all went well and she is now home again recuperating. Still weak and frail, but I believe all is going slowly better. We all remember her from those days and whish her all the best and some good times to come. This entry was posted in Articles on 6 February 2016 by Ilse van Erp. Kennel Club of Harare held their Christmas lunch on 2 December at Alo Alo restaurant. Erica Scotton Nee Crouch on Would Neville have a giggle?